Sodium carbonate commonly known as washing soda is manufactured by Solvay – ammonia process. Principle: The process is based upon the principle that when carbon dioxide is passed through brine solution saturated with ammonia, the following ions are present in the solution. Sodium bicarbonate being sparingly soluble, crystallizes out. This is finally calcined to form sodium carbonate. Because of the common ion effect due to the presence of Na+ ions of sodium chloride, sodium bicarbonate precipitate out. It is filtered and then ignited to get sodium carbonate. Sodium carbonate is purified by passing CO2 through its aqueous solution. The sodium bicarbonate thus formed is filtered and heated to give pure sodium carbonate. Recrystallization from water produces washing soda, Na2CO3 ·10 H2O. The concentration of H2CO3 is very low. Since H2CO3, is a very weak acid the concentration of HCO3‾ in the reaction mixture is extremely low. To shift the equilibrium in the forward direction ,a base such as NH3 is used which combines with H+ ion to form NH4+ ion. 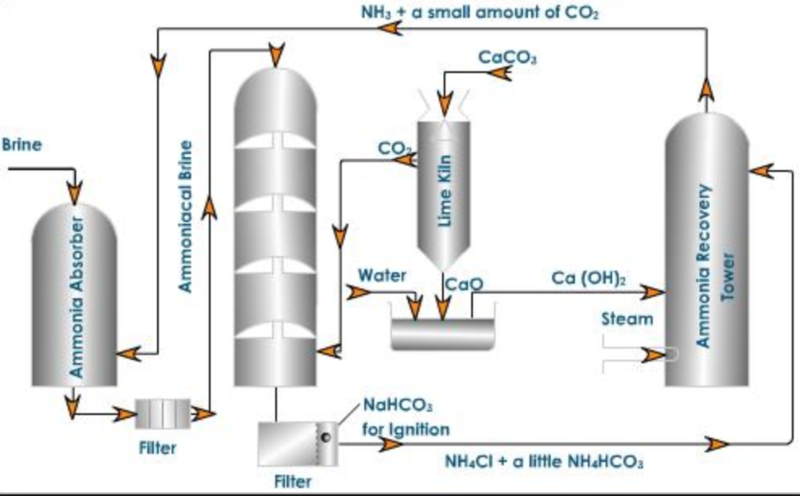 The function of ammonia is to produce a sufficient amount of HCO3‾ ion which enables sparingly soluble NaHCO3 to precipitate out of the reaction mixture. Ammoniated tower : A saturated solution of brine is introduced into the top of the iron tower while gaseous ammonia from ammonia recovery tower is passed from below. As a result of this counter current process, brine gets saturated with ammonia while calcium and magnesium present as impurities in commercial sodium chloride get precipitated as their corresponding insoluble carbonates. The ammoniated brine thus obtained is passed through filters to remove precipitated calcium and magnesium carbonate and then passed through the carbonation Tower. Carbonation Tower: It is made up of iron and is fitted with a number of perforated horizontal partitions. The clear ammoniated brine solution is made to trickle down from the top of the tower while carbon dioxide from lime kiln is introduced from the bottom at a pressure of 1 – 2 atmosphere. Carbon dioxide rises through the small holes and reacts with ammoniated brine to form sodium bicarbonate. The solution flowing out of the carbonation tower contains tiny crystals of sodium bicarbonate. These are filtered by passing through vacuum filters. The sodium bicarbonate obtained above is heated strongly or calcined in a kiln when sodium carbonate is formed. Carbon dioxide is generated by heating limestone to about 1273 K.
The carbon dioxide is brought to the carbonation tower while lime is slaked with water in a tank known as slaker to form milk of lime which is pumped to the ammonia recovery tower. Quick lime left in the lime kiln and ammonium chloride left in the mother liquid after removal of NaHCO3 are reacted to produce ammonia .Therefore, except for small losses ,no additional ammonia is required. Carbon dioxide produced during conversion of NaHCO3 to Na2CO3 is reintroduced in the carbonation lower. Thus NaCl and CaCO3 are the only raw material used which are quite cheap. At the same time CaCl2 is produced as a by product. Solvay ammonia process is economical ,continuous and self contained. Potassium carbonate cannot be prepared by solvay process. Potassium carbonate cannot be prepared by the Solvay- ammonia process because unike sodium bicarbonate which is sparingly soluble in water, potassium bicarbonate is fairly soluble in water. When carbon dioxide is passed through ammoniated brine, NaHCO3 gets precipitated while KHCO3 does not get precipitated when CO2 is passed through ammoniated solution of potassium chloride. 1) Sodium carbonate is a white crystalline solid which crystallizes as decahydrate. 2) It is readily soluble in water. 3) Action of heat : On heating below 373 K, it loses 9 molecules of water of crystallization to form monohydrate. On heating above 373K ,the monohydrate changes to an anhydrous white powder called soda ash but does not decompose further. 4) Hydrolysis: Being a salt of a strong base and weak acid when dissolved in water, sodium carbonate undergoes hydrolysis to form an alkaline solution. 5) Action of acids: It reacts with dilute mineral acids evolving carbon dioxide gas. 6) Reaction with milk : With hot milk of lime, Ca(OH)2 , it reacts to form sodium hydroxide. 1) It is used for softening of hard water ,laundry and cleaning. 2) It is used in paints and dyes. 3) It is used in the manufacture of soap ,glass, borax caustic soda, sodium phosphate. 4) A mixture of Na2CO3 and K2CO3 is used as a fusion mixture. 5)It is used in paper and textile industry and also in petroleum refining and metal refining. 6) It is used as a reagent in the laboratory.